Broad Street Bridge, Mason, Texas. The only example of a reinforced concrete truss bridge in Texas is in the city of Mason. 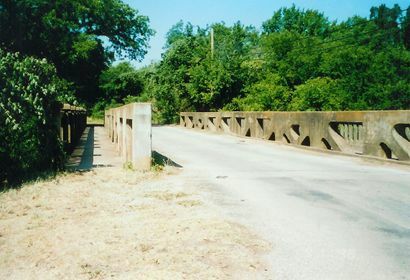 The Broad Street Bridge was built in 1918 for $9,000 by The Alamo Construction Company of San Antonio, and is still in use to cross Comanche Creek. Because the railroad never connected to Mason, large, prefabricated steel units could not be brought to the site. Therefore, the bridge was built of reinforced concrete in a Howe truss pattern. The span is 102' long and composed of two 51' spans supported by concrete abutments with a pier at the center. A concrete walkway on each side was also included in the design. 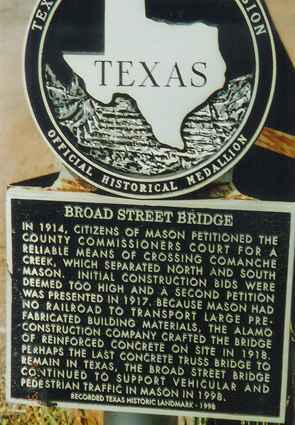 Broad Street is on the north side of Mason's historic downtown square and the bridge displays a Texas Historical Commission Medallion. To share history, stories or photos of the Broad Street Bridge and other Texas bridges, please contact us.